Free convert NTFS to FAT32 software to easily convert NTFS to FAT32 without losing datain Windows 10, Windows 8/8.1, as well as Windows 7. 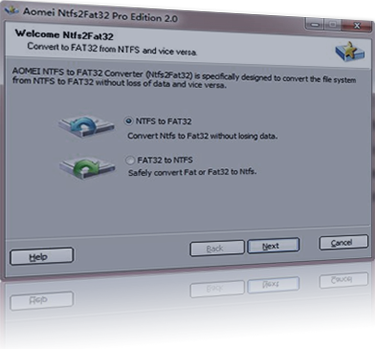 AOMEI NTFS to FAT32 Converter 2.0 (Ntfs2Fat32) is a professional and FREE utility for converting file system from NTFS to FAT32 without data loss, and also it supports convert FAT, FAT32 to NTFS. It is a free tool configured in AOMEI Partition Assistant. Meanwhile, it is a reliable, efficient and easy to use Windows file system converter. No matter when it needs to format NTFS to FAT32 and vice versa, nothing can prevent you from doing these operations. Safely convert NTFS to FAT32 or convert FAT, FAT32 to NTFS without losing data. Format/reformat/change to FAT32 partition from NTFS on the basis of ensuring data security. Decrypt the encrypted files featured with NTFS at one time. Support NTFS partition with the maximum capacity of 2TB. Automatically decompress the compressed files featured with NTFS at a high speed. Easily and efficiently reach the conversion by few clicks. SATA, SCSI, USB disk, FireWire disk etc. Why Choose AOMEI NTFS to FAT32 Converter? Is it troublesome to convert NTFS to FAT32 with built-in disk management in a using computer? Conversion function is not supported by Windows. To reach the conversion, the following steps must be done: "Backup data" -- "Reformat partition to FAT32" -- "Restore data". (Note: a partition larger than 32GB is not supported to convert to FAT32 on Windows). These operations will waste so much time and vitality. However, all these operations can be done within 3 steps with AOMEI Ntfs2Fat32 Converter. PC partition management freeware. Easily and quickly extend, shrink, create, delete, wipe, format, split, merge partitions. PC backup & restore freeware. Backup, restore as well as clone system, partition, disk to protect computer and its data.